This Week’s Passage: Be imitators of God, therefore, as dearly loved children 2 and live a life of love, just as Christ loved us and gave himself up for us as a fragrant offering and sacrifice to God. So the reason that Paul gives as to why we are to be imitators of God is because of how much we are loved. This takes me back to Ephesians 3:18-19 where Paul is praying that we would be able to grasp just how much we are loved by God. So it would seem that the implications of fully grasping this fact are far reaching – not only will we be “filled to the measure of the fulness of God” but we also be able to imitate God. Probably these go hand in hand. The recurring theme then is the vital importance of “getting it”. Of getting it way down in the depths of our soul that we are inimitably loved So how to we go from knowing that God loves us to KNOWING that God loves us. I’d like to hear your thoughts. Here are a few things that come to my mind…. Pray – This is what Paul was doing in Ephesians 3:18-19. He was praying for his friends that they would fully grasp the incredible depths of the love of Christ for them. And this is where I think we must begin. We must plead with God to enable us by His Spirit to “get it”. The quest to KNOW the love of God begins on our face before the throne of God. Ponder – By and large God’s people today are not a thinking people. We have become lazy and allowed our pastors or SS teachers or favorite bloggers or google search to do our thinking for us. We MUST beging to think deeply about things – and thinking on how God has loved us through the sacrificial death of His Son is a great place to start. Practice – In other words, allow God to use you to “live a life of love” – to demonstrate the love of Christ in real and tangible ways to the people around you. The theory is this – the more we put into practice what we know about the love of Christ, the more God will expand our KNOWING. Give it a try. What have you got to lose. My Comments: 1) As we observe signs of grace in other people and give God thanks for them it seems like it would be a good idea to let those people know how we see God at work in their lives – as a way of encouraging them. 2) There is an old expression that states, “Don’t be so heavenly minded that you are of no earthly good.” Clever and catchy cliché – the only problem is that these words are unbiblical. Our hope for the future ought to fuel not only our praying but also everything about the way that we live. It is because we have a future that makes our present joyfully bearable. This Week’s Passage: 29 Do not let any unwholesome talk come out of your mouths, but only what is helpful for building others up according to their needs, that it may benefit those who listen. 30 And do not grieve the Holy Spirit of God, with whom you were sealed for the day of redemption. 31 Get rid of all bitterness, rage and anger, brawling and slander, along with every form of malice. 32 Be kind and compassionate to one another, forgiving each other, just as in Christ God forgave you. Do not let… Get rid of… – We have a choice with how we use our words. And we need to be careful with what we let come out of our mouth. One of the things that angers me the most is when I hear somebody say something hurtful to someone else. This happens a lot more than you might think. Watch what you say! …according to their needs – This means that we need to understand what the other person’s needs are before we open our mouths. Do they need support, compassion, encouragement? Do they need a word of grace or a word of truth? Do they need hope? Or do they just need to know that someone cares? I think for me that more often than not I am guilty of speaking at people rather than to people and their needs. Do not grieve… – I’m not sure that we understand that when we say hurtful things we are not just hurting someone we are hurting God – causing His Spirit to grieve. Perhaps if people were more aware of this they would be more careful with what they say. One the things that I will always remember my pastor Don Chasteen saying is that “Hurting people hurt others.” It would serve us well to remember this the next time that someone says something hurtful to us. Their words are more of an indictment of themselves than than of us – and it is an indication that they are hurting inside and desperately need us to show them compassion and forgiveness – in the same way that it has been shown to us. When we do this we incarnate the gospel and demonstrate the love of Christ to people in real and genuine ways. – Vocalize your prayers. Articulate them. The energy devoted to expressing your thoughts in words and sentences will order and discipline your mind, and help deter meandering. – Pray over the Scriptures.Tie your praying to your Bible reading. – Journal your prayers.If you are writing your prayers you are not day dreaming. 3) Develop a system for your prayer lists... It is difficult to pray faithfully for a large spread of people and concerns without developing prayer lists that help you remember them. 4) Pray until you pray…That is Puritan advice. If we do this we eventually come to delight in God’s presence, to rest in His love, to cherish His will. In the Western world we urgently need this advice, for many of us in our praying are like nasty little boys who ring front door bells and run away before anyone answers. My Comments: All of these are things that I need to pay attention to. But probably especially #4. Which one do you most need to incorporate into your prayer life? This Week’s Passage: 25 Therefore each of you must put off falsehood and speak truthfully to his neighbor, for we are all members of one body. 26 “In your anger do not sin”: Do not let the sun go down while you are still angry, 27 and do not give the devil a foothold. 28 He who has been stealing must steal no longer, but must work, doing something useful with his own hands, that he may have something to share with those in need. The devil may be a lying snake but he is not stupid. He is smart enough to know better than to just barge in and try to wrestle control away from Jesus – who is dwelling in our hearts. He is crafty enough to patiently bide his time, waiting for the right opportunity to get a foot in the door. His strategy is not to tussle with Jesus, because he knows this would be a losing battle, but rather to entice us to relinquish control willingly. He does this with subtlety and cunning. He allows us to get used to the idea of him hanging around before he makes his major play. And then when he does make his move his postion is so entrenched that nothing short of a prolonged spiritual battle can get rid of him. In essence, when we give the devil a foothold to come in to our lives we are asking Jesus if He would leave. Satan’s strategy has proven to be a very effective! In what ways have I allowed the devil to gain a foothold in my life? Have I grown so used to him being there so that I don’t even notice that he has infiltrated my life? Do I want more of Jesus or do I want more of the devil and his playthings? Am I willing to go to war in order to get rid of him? Who are the people that I trust that know me well enough to help me identify satanic footholds? So it would seem that doing nothing is not an option unless we want evil to triumph in our lives. Don’t let the evil one gain a foothold – and if he already has one DO SOMETHING ABOUT IT! For the next # of weeks I will share some thoughts by D.A. 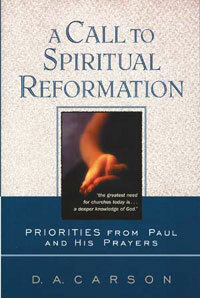 Carson that come from his book A Call To Spiritual Reformation (subtitled: Priorities From Paul and His Prayers). “The one thing we most urgently need in Western Christendom is a deeper knowledge of God. We need to know God better. So last night was a historic night – especially if you are a long time Mets fan. I adopted the Mets as my team back in 1967 when they were perennial cellar dwellers. I went to a ball game in Atlanta to see the Braves vs the Mets and came away a fan for life. Baseball was my sport. I played it whenever I could. I watched it whenever I could. Like many kids back in those days I knew champions and statistics of players who had died long before I was ever born. I WAS the kid on The Sandlot. Tom Seaver, Jerry Koosman, Nolan Ryan, Ron Swoboda, Cleon Jones, Tommie Agee, Bud Harrelson, Tug McGraw, Jerry Grote, Art Shamsky, Donn Clendenon, Al Weis. managed by Gil Hodges. Heroes. They were dubbed The Amazing Mets. It was a magical year. We saw a man walk on the moon in July and we saw a team go from next to last place to first place (in 1968 they finished 24 games in back of the St Louis Cardinals) to win a World Series. The last 40 years have been interesting. 3 more World Series appearances: Losing to the Oakland A’s in ’73. Winning in miracle fashion against the BoSox in ’86. Losing to the Yankees in 2000. Several heart breaking years when they had things wrapped up and then just folded down the stretch. But through it all – always a fan. Back to last night. Historic. The Mets organization started back in 1962. That makes 50 years. And NEVER in all 8,019 games (prior to last night) had anyone thrown a no-hitter. A couple of guys had come close. A bunch of guys threw them for other teams after leaving the Mets (most notably would be Nolan Ryan) but never for the Mets. And last night it finally happened. Johan Santana. You can read about it HERE if you like. So I figured today was as good a day as any to chronicle a bit of my love affair with the Amazin’s. 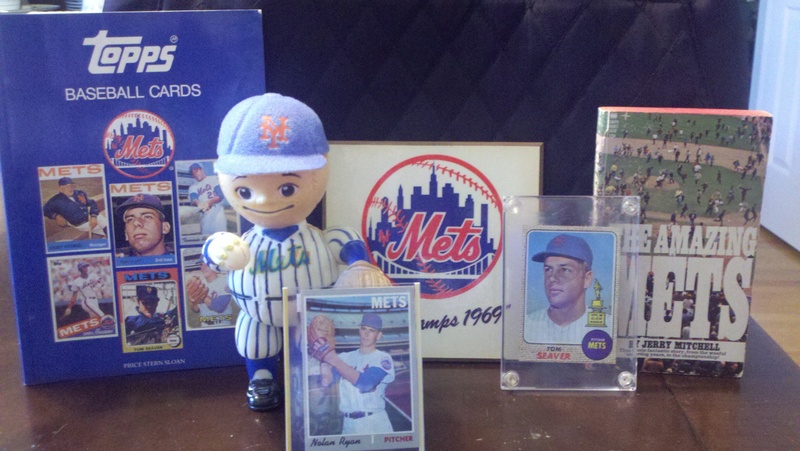 Here is a picture of some my Mets memorabilia. I brought it out just to relive my childhood, to bask in the celebration of a no-hitter, and to get ready for a playoff run this year. The boys are playing good ball. We’ll see if it lasts. Always a fan! This Week’s Passage: 20 You, however, did not come to know Christ that way. 21 Surely you heard of him and were taught in him in accordance with the truth that is in Jesus. 22 You were taught, with regard to your former way of life, to put off your old self, which is being corrupted by its deceitful desires; 23 to be made new in the attitude of your minds;24 and to put on the new self, created to be like God in true righteousness and holiness. But I’m afraid that that one of the reasons that the church of the 21st century is in many ways shallow and anemic is because we neglected to share the bad news – or at least we have down played it so that the cross has become not much more than an iconic religious symbol rather than the means of our salvation. Whatever happened to genuine repentance and to weeping over sin? Whatever happened to an awe inspiring understanding of the holiness of God? Our evangelism has focused so much on “God loves you” that we forget that “God hates sin.” And even when we do talk about God hating sin we dilute the whole notion by saying “God hates the sin but he loves the sinner.” This is not altogether true. God hates sinners! Think on these things lest you believe a cheap gospel!